A scan detects and identifies network and host vulnerabilities in your environment. Scans can perform external attack simulations as well as comprehensive vulnerability checks including registry evaluation. Alert Logic scans can also help you meet PCI compliance requirements. This topic describes the types of scans that are supported, best practices for running successful scans, and how to configure and manage scan definitions and results. A suggested workflow for using Alert Logic vulnerability scans to meet your PCI compliance requirements is also provided. internal An internal scan runs from an Alert Logic appliance in your environment. When you define a scan, you can specify credentials to use with the internal scan. If you provide credentials, Threat Manager can log on to each host on your network and collect information about the host while it performs comprehensive vulnerability checks including registry setting evaluation. If you do not provide credentials, Threat Manager scans your network without logging on to each host and performs as many checks as possible. external An external scan runs from the Alert Logic data centers against your environment. This type of scan simulates attacks from outside your network and identifies potential issues from these attack types. PCI A PCI scan is a special type of external scan that is used specifically for Payment Card Industry (PCI) compliance requirements. When configuring your scans, use the following guidelines to create successful scans and scan results. Alert Logic performs vulnerability scans, not penetration testing. AWS treats scanning the same as penetration testing, requiring scan clients to fill out and submit a penetration testing request form. This authorization allows AWS to differentiate between testing and a real attack on their systems. The process and form for requesting authorization from AWS are located here. Cloud Insight is automatically authorized to scan in AWS. While Azure does not require pre-approval for scanning, clients must comply with their terms and are encouraged to fill out and submit a penetration testing notification form. The terms and notification form from Microsoft are located here. Schedule your scans to be both effective and efficient. Scan your servers, firewalls, and routers during off-peak times. To effectively balance scanning resources across your enterprise, configure scanning of data center assets to occur during off-peak times. Do not scan during service windows. Service windows are the times when you do backups, hardware maintenance, or apply patches. Valid scan results require that the server is powered on and not in the middle of a reboot. For best results, scan after you apply patches and not while applying patches. Scan your workstations during working hours. At night, laptops go home and workstations get powered off. Scan laptops and workstations when they are available on your network. Scan new computers before use. Scan new servers before you plug in to the Internet. Time to infection for an unpatched, unprotected server can be less than an hour. Scan often. Security is a moving target that you cannot hit in three month scan intervals. Establish a reasonable schedule that scans as frequently as possible and can be adhered to. Open your scan window. Because of improvements in scanning technologies, you do not necessarily need to limit your scanning activities to narrow time frames during off-peak hours. It is generally safe to let your scan run during normal business hours without impact to performance or availability of assets. Many customers run their scans continuously. Run open-ended scans. When scheduling your scan, consider leaving the scan end time blank. Split up long scans. Rather than a single, comprehensive scan, use multiple scans. Set several smaller scopes and spread the load across multiple scanners. Run scanners in parallel. If you have multiple appliances, you can run scans in parallel. Running scans in parallel requires spreading scans across multiple appliances. Consider what to scan and how often to scan it. Your scanning strategy might require multiple scan definitions with different schedules and frequencies. Scan common TCP and UDP ports often, at least once a week. Almost all new vulnerabilities appear on common TCP and UDP ports. Use authenticated scanning on common ports. This is the best way to lower scan times, reduce false positives, and detect the latest vulnerabilities. Scan all ports infrequently. Scanning all TCP ports and all UDP ports is time-consuming and has minimal benefit over scanning common TCP and common UDP ports. As a general best practice, on external systems, disable all UDP ports at the host level, the firewall level, and the router level. Unless you have a specific reason, do not have open UDP ports on your internet-facing systems. Do not scan "all ports open" configurations commonly found on firewalls. To improve security posture, some users implement firewall or router configurations that are designed to slow scans. These configurations are designed specifically to slow down an attacker but will slow down your scans as well. Scanning targets with these types of configurations should not be done as part of regular scanning, but should be scanned individually using an outside vendor tool to assess the effectiveness of the protection mechanism. If you decide to use this protection mechanism, ensure that Alert Logic appliances and external scanners are whitelisted and not affected by the protection mechanism. Configure personal firewalls to allow access by scanner. Where personal firewalls are used for desktops or workstations, credential-based scans are not possible without configuration setting changes. Configure Windows firewalls to allow scanner access on Windows Management Instrumentation (WMI), configure your Linux box to allow access via SSH, and then run a credentialed scan. Scan a range of 256–1024 IP addresses at a time. Scanning large IP address ranges (for example, 10.0.0.0/9) will send large amounts of unnecessary traffic to your network which might cause the scan to fail. Avoid configuring multiple scans that overlap IP address ranges. This creates redundant results and extends scan times. Scan DMZ, internal servers, and workstations separately, as they will likely need different levels of attention. Also, consider limiting scope by role (for example, database, web, application, QA, test, development, production). When setting up your scans, consider your strategy. Develop an implementation that is particular to your scanning targets and environment. Establish your initial scan window. The time required to complete a scan is greatly dependent on the types of scans you run as well as environmental factors like hosts and bandwidth. If you must set an end time and want to determine the scan window requirements, run a one-off scan without an end time to establish the initial duration, and then add 20-30 percent more time to accommodate future growth. If the scan takes longer than you want, consider reducing scan scope and spreading scans across multiple appliances to reduce time. Be mindful of what you are scanning. In terms of length, not all types of scans are equal. Windows-credentialed scanning takes longer than all other credentialed or non-credentialed scans. Under test scenarios, Windows-credentialed scans have taken up to four times as long as other scans. The web application scanning component used in Alert Logic PCI scans can also run long due to the amount of web pages present and the number of fields on each page, multiplied by the number of sites being scanned. Consider these factors when defining your scans and determining scan windows. Multitask. Scan your servers and workstations separately in a staggered schedule to allow remediation in stages. For example, you can perform remediation on servers while scans on workstations continue to run. Try not to scan over WAN links or VPN. The traffic between the scanner and the scan target is high compared to the relatively low traffic between the scanner and Alert Logic. Place the scanner on the same side of the VPN or WAN link as the scan target for the best use of your bandwidth. Use un-credentialed scans as fallback. Credentialed scans produce the most accurate results and should be used on all servers and workstations. Un-credentialed scans should be used only for devices where credentialed scanning is not available, for example, routers, switches, and printers. The following table contains the broad range of IP addresses owned by Alert Logic for existing and future use. Alert Logic scanning technologies use a specific subset of these IP addresses for scan origination. Make sure that your active protective mechanisms, such as IDS, IPS, WAFs, and firewalls that can send shun/block requests, to allow scanning traffic from all of the following IP addresses. You can access most scan-related features from the Scans page in the Alert Logic console. These features include creating and scheduling scans, managing scan results, and processing steps for PCI compliance. In the Alert Logic console, click OVERVIEW, and then click Scans. Statistics: Access summarized vulnerability information for your environment from overall scan results. See View vulnerability statistics. Scans: Create and update scan definitions and access scan results. PCI Compliance: Create PCI scans and access PCI scan results. See Manage PCI scans. Search: Search scan results for criteria such as vulnerability name and risk levels. See Search scan results. You can access detailed information about network and host vulnerabilities discovered during internal and external scans from the Scans tab on the Scans page in the Alert Logic console. From the Scans tab, you can create new scans, edit existing scan definitions, and view scan results. For information about PCI scans, see Manage PCI scans. From the Scans tab on the Scans page, you can view scheduled vulnerability scans, scan status and results, and links to disable, enable, and delete the scans. On the Scans page, click the Scans tab. If you manage more than one customer, in the Customer drop-down list, select the customer, and then click Go. Scheduled scans, scan status and results, and links to disable, enable, and delete the scans are displayed. (Optional) To change the definition of a scan, see Modify scan definition. (Optional) To change the status of a scan, see Modify scan status. You can define and schedule scans to run on a regular basis to help you identify vulnerabilities across your organization. From the Scans tab, you can define and schedule internal and external scans. For information about setting up PCI scans, see Manage PCI scans. If you have access to more than one entity, use the drop down menu to select the entity you want to scan. Fill in the information according to the instructions below. In Scan Title, type a descriptive name for the scan. Internal Scan: This scan originates inside your network, behind your firewall, and shows an insider threat perspective. External Scan: This scan originates from Alert Logic, outside your network, and shows an outside threat perspective. If you chose Internal Scan, choose Appliances for your scan. The Unavailable Appliances box lists all appliances that are offline or deactivated. If you chose External Scan, the Appliances option is not available. Full Scan is a complete scan on all in-scope devices. Uphost only scan is a scan that detects only the alive/offline status of each host. Choose whether to scan by Zones, Host Groups, or Individual IPs, and then choose the appropriate item(s) from the list that appears. Zones are created around Alert Logic appliances. Set up zones on the Management page. Choose one or more zones from the list. Press and hold the Ctrl key to select multiple items. To select adjacent items, click the first item, press and hold the Shift key, and then click the last item. Host Groups are sets of one or more hosts. Multiple host groups may reside within a single zone. Set up host groups on the Management page. Choose one or more host groups from the list. Press and hold the Ctrl key to select multiple items. To select adjacent items, click the first item, press and hold the Shift key, and then click the last item. Individual IPs allow you to select the specific IPs to scan. You may enter addresses, subnets, or address ranges. When you are done typing the information, click Add the above hosts to the scan to add them to the list. You may add more hosts or remove them from the list. Enter user credential information to ensure the scanner has access to all necessary parts of your network. Alert Logic recommends adding user credentials for the most accurate scan. The prompt accepts information for Windows Credentials, SSH Credentials, and SNMP Community Names. For more information on authenticated scanning, click here. If you selected an External or Uphost only scan under Scan Details, you can not enter user credentials. In the Port Scan Options menu, choose one or more port groups to scan, or enter a list of custom ports. Make a selection from the drop-down list and then click Add port selection. The table below the drop-down menu shows the port groups you selected and indicates if they are Fast or Heavy scans. You may add more groups or remove them from the list. If you want a custom set of both TCP and UDP ports, select Custom TCP Ports and list your ports, and then click Add port selection. Repeat the process to add your list of Custom UDP Ports. Set the timing of the scan. You may choose to scan once or set a recurring scan that runs quarterly, weekly, or on specific days of the month. Choose the first, second, or third month of the quarter in the Run scan in: drop down menu. Set the day of the month in the on this day: text box. Every Week:Set the day of the week for the scan to run. Specific Days of the Month: Type in the date(s) you want the scan to run each month. If you want your scan to run later in the month, you should set it for the 28th at the latest. If you set it for the 31st, you will miss February and the months that have only 30 days. Use the drop down menus to choose the day you want the scan to run each month. For example, you may set it to the second Wednesday every month. Enter a date to run a single scan. This option puts the scan in the queue so that it runs as soon as possible. In the Run scan from: box, set a time for the scan to begin. This option is not available if you chose to run the scan as soon as possible. In the Time Zone drop down menu, select a time zone. This option is not available if you chose to run the scan as soon as possible. For Scan end time (optional):, set a time for the scan to end. Alert Logic recommends leaving this option empty because it may abort your scan before it is finished. Check the box to Enable roll-over scanning. Alert Logic discourages using roll-over scanning, as the feature is deprecated. If necessary, enter specific IPs in IP Addresses to Exclude. You may enter addresses, subnets, or address ranges. When you are done typing the information, click Add the above hosts to scan to add them to the list. You may add more hosts or remove them from the list. Alert Logic discourages excluding items from your scans. Check the box to have Alert Logic send an email containing the scan results after the scan completes. Choose email contacts from the list, and add as many as you want. If you choose to send scan results through email, know that your vulnerability information will be sent as cleartext (unencrypted text) over the Internet via traditional email. Check the Create a case when scan completes check box to track your scan results on the Cases page. After you have created a scan, you can modify its definition. For example, you can change what IP addresses are scanned, when the scan is scheduled to run, or the credentials used to log in to host computers. In the displayed list of scans, click the Scan Title of the scan to modify. On the Edit Scan page, modify the scan definition, and then click Save. Each defined scan has a status, which is displayed in the list of scans. Scheduled scans that are enabled show a status value of a date (for example, Sep 8 2016 10:00pm), which is when the scan is scheduled to run next. Additional status values include scanning, suspended, and disabled. You can modify the state of a scheduled scan if needed. For example, to minimize potential risk when you make changes to your network, such as the roll-out of a new version of software on your mission critical servers or devices, you may want to deactivate a scan. The scan remains disabled until you enable it again. You can also suspend or resume a scan that is in progress, or delete a scan entirely. To change the next scheduled run date for a scan, which is a part of the scan definition, see Modify scan definition. To disable a scheduled scan, click Disable. To suspend a scan in progress, click Suspend. To resume a suspended scan, click Resume. To cancel a suspended scan, click Cancel. To delete a scheduled scan, click Delete. Through the Scans feature, you can access valuable vulnerability information about your network through your scan results. You can view high-level trend information as well as granular details. Reviewing the details of scan results helps to identify issues you can address to improve your security posture. Several types of trend views are provided to help you better understand your recent activity at a high level. If you manage more than one customer, you cannot view the statistics for all of the accounts without logging in to each account individually. On the Scans page, click the Statistics tab. You can easily view the results for each scan execution. From the results, you can view details about any vulnerabilities that are found. You can also export scan results in PDF or .csv format for download. Enable: Set the scan to run on a set schedule. Delete: Delete the scan results from the system. In the Results column, click the linked number of hosts to open a list of hosts and the vulnerabilities for each. Click PCI Scan Results to see the PCI scan page. Click the icons in the Export column to download reports in various formats. Click the green CSV icon ( ) to download a .csv file with vulnerability and exposure details. Click the blue CSV icon ( ) to download a .csv file with host details. The industry-standard CSV downloads include detailed host and vulnerability information. The format allows you to analyze, sort, and filter the information externally in the software of your choice. Alert Logic recommends the use of the CSV downloads for all scan analysis. Click Delete to delete the scan results. This deletes results from the selected date only. 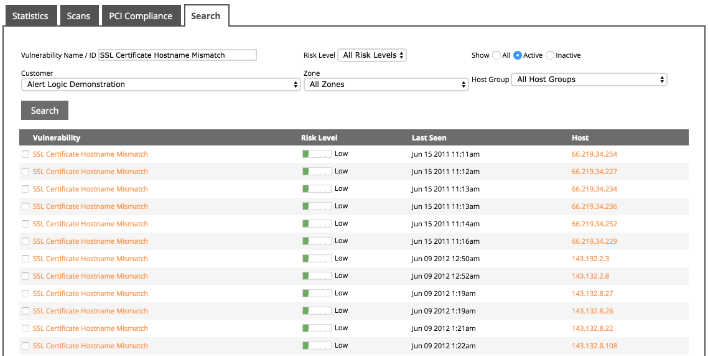 You can search all saved scan results for specific vulnerabilities by name or ID, risk level, zone, and host group. You can also filter your search results by all, active, or inactive vulnerabilities. This feature is useful if you discover a vulnerability and want confirmation, or if you discover a security breach and want to discover the vulnerabilities of a host. On the Scans page, click the Search tab. Enter and select the appropriate options, and then click Search. Example: A review of your scan results list reveals a vulnerability called "SSL Certificate Hostname Mismatch." You want to know if this vulnerability affects any of your hosts. In the Search tab, in the Vulnerability Name/ID box, enter SSL Certificate Hostname Mismatch, select Active, and then click search. A list of occurrences appears. If you cannot resolve a vulnerability immediately, you can temporarily deactivate the vulnerability. When you deactivate a vulnerability, the Alert Logic console does not remove the vulnerability from reports. You can deactivate vulnerabilities for a specific host or for all hosts. You cannot deactivate a PCI scan vulnerability. Example: You want to install a service pack for a database application, but doing so may break other applications that depend on that database application. You can deactivate that vulnerability until you can resolve the related application issues. Next to the scan that identifies the vulnerability to deactivate, click and expand Results. Under the Results column, next to the date the scan was run, click the hosts link. In the Hosts window, under the appropriate host, click the name of the vulnerability. Check one or more vulnerabilities you want to deactivate. On the bottom right, click Change Status. This Host—Deactivates this vulnerability on this host only. All Hosts—Deactivates this vulnerability on all hosts. With this option, you must provide a global descriptive note. Sometimes vulnerability scans identify a vulnerability in your environment that may be a false positive. To investigate an identified vulnerability that may be a false positive, contact Alert Logic. The security analysts in the Alert Logic Security Operations Center (SOC) carefully review the vulnerability and assess the accuracy of the result. For PCI scans, false positives of High, Critical, or Urgent levels require a dispute. To learn how to dispute a PCI scan false positive, see Dispute failing vulnerabilities. From the heading of the report that contains the vulnerability in question, find the date the report ran and the Report ID. Contact Alert Logic Support at (US) (877) 484-8383 or (EU) +44 (0) 203 011 5533. Send an email to support@alertlogic.com. If the security analyst determines the vulnerability is a false positive, the security analyst updates the vulnerability in the system database. As part of your maintenance activities, you can "clean up" scan results. When you clean up scan results, certain results are hidden in the Alert Logic console, providing you with a cleaner view. You can clean up results predating a specific date, or you can clean up results for individual scans. The hidden results remain in the system and are included in your reports. You can hide older scan results from the Alert Logic console by specifying a date and time; results with a Scanned Date that is older than the specified date are hidden. If you manage more than one customer, select the customer in the Customer list, and then click Go. Click Clean up Scan Results. In the Clean up Scan Results dialog box, enter the date and time before which to hide scan results, specify whether to also hide inactive scans, and then click Clean up. You can hide individual scan results from the scan list. On the Scans page, select the Scans tab. In the row of the scan for which to hide results, click Results. A list of scan executions appears, ordered by scan date. For each Scanned Date row, click Delete to hide the results of that particular scan. Through the Alert Logic console, you can schedule quarterly external scans that are required for Payment Card Industry (PCI) compliance. You can quickly and easily view the results of those scans in the Alert Logic console, and then work with Alert Logic, as needed, to resolve vulnerabilities and prove compliance to auditors. Working with PCI compliance requires documents available from the PCI Security Standards Council (PCI SSC). Documents include the Payment Card Industry Data Security Standard (DSS) and the current release of the ASV Program Guide. The following procedure outlines the suggested workflow to use Alert Logic vulnerability scans for your PCI compliance requirements. View PCI compliance status and history. When you run a PCI scan, Threat Manager generates a preliminary PCI compliance report and sends an e-mail to the configured alert devices. If your preliminary PCI compliance report indicates that you are compliant, then complete your final PCI compliance documentation. If you have a vulnerability that you believe contains a false positive, contact Technical Support (US:(877) 484-8383, EU: +44 (0) 203 011 5533) to discuss the vulnerability. If you have a vulnerability that you cannot address due to a business or technological constraint, dispute the failing vulnerabilities, and then contact Technical Support (US:(877) 484-8383, EU: +44 (0) 203 011 5533) to discuss the vulnerability and any compensating controls in your environment that reduce the risk associated with the vulnerability. After you address all vulnerabilities and resolve disputes, then complete final PCI compliance documentation. Threat Manager simplifies tracking, analyzing, and documenting your PCI compliance. In the Alert Logic console Scans page, on the PCI Compliance tab, you can view your current and historical PCI compliance status. By default, your PCI compliance status is "Non-Compliant." The status changes to "Compliant" only after you generate your final PCI compliance report. For more information, see Complete final PCI compliance documentation. On the Scans page, click the PCI Compliance tab. A list of the latest PCI scan results are displayed. To view your most recent PCI compliance scan results, under Latest 25 Reports, click the name of the report to view. At the top of the Alert Logic console, in the drop-down menu, click Reports. In the left navigation pane, expand Archived Reports. When you schedule a PCI scan, Threat Manager runs the scan as specified in the schedule, and then displays the results of the scan in the PCI Compliance tab. You are responsible for proper scoping of the scans, and the scan includes all required components for a PCI DSS scope. You implemented network segmentation if you excluded any components from PCI DSS scope. For more information about attestations, see the ASV Program Guide. On the New PCI Scan page, in the Scan Title field, enter a descriptive title for the scan. Click the check box if you want to create a case when the scan completes. To include multiple domains, enter each domain on a separate line. Do not use commas, semicolons, or other separators. The box also uses what you enter to seed the scanner. Seed entries include hidden URLs that cannot be reached from the homepage. These seed URLs allow the scanner to reach more of your application, ensuring the most thorough possible scan. In Addresses to exclude, enter the TCP/IP addresses of the hosts you want to exclude from the scan operation, if applicable. In Your top level domains for scoping suggestions, enter top-level domains to help the PCI scanner find more scan targets that you want to include in the scan. Under Scan Schedule, specify how often to run the scan, the start time, and your time zone. Under Notification Settings, type the email address where you want to receive notifications when the scan is finished. After viewing the results of a PCI compliance scan, if the status displays "Non-compliant," you must address vulnerabilities. A scan retains its non-compliant status until you generate a final report. Under Latest 25 Reports, click the name of the non-compliant results that contain the vulnerabilities to address. In the PCI Scan Result report, click the name of the vulnerability to address to view information about the vulnerability, including the CVE number, a brief description of the vulnerability, and possible solutions. Review the information for the vulnerability and address as necessary. If you cannot address the vulnerability due to a business or technical constraint, you can dispute the vulnerability. For more information, see Dispute failing vulnerabilities. After you address each vulnerability identified in the PCI Scan Result report, run the scan again to verify you addressed the vulnerability. See Re-scan a non-compliant PCI scan. PCI-DSS requires web sites to use strong cryptography and security protocols such as Secure Socket Layer/Transport Layer Security (SSL/TLS) or Internet Protocol Security (IPsec) to safeguard sensitive cardholder data during transmission over open public networks. In addition, you must disable insecure protocols like SSL 2.0 and weak ciphers, or you will fail a PCI compliance scan. Open the httpd.conf or ssl.conf file, then search for the SSLCipherSuite directive. If you do not have the directive, add it. The following registry settings can help secure ciphers and encryption settings for Microsoft Internet Information Server (IIS). Alert Logic makes no warranty as to the efficacy of the script. Many services on a Windows computer may use SSL/TLS such as Remote Desktop, LDAP, HTTPs, SMTPs, or Windows remote management ports. Changing the encryption settings may affect other services. This script may need to be customized for your environment. Use this script at your own risk, and try it on a development environment first. Before you edit the registry, export the keys in the registry that you plan to edit, or back up the whole registry. Restart the server after implementing the registry changes. You can run a PCI scan between scheduled scan times. If a scheduled PCI scan result is "Non-compliant," and you have addressed the vulnerabilities discovered by the scan, you can use the re-scan feature to determine compliance. Click the PCI Scan Result with a status of "Non-compliant." A PCI scan may report findings that you want to dispute. For example, the scan may identify a vulnerability in your environment that may be a false positive. Or, the scan may identify a vulnerability that you cannot address due to a business or technological constraint but that you could resolve through the use of a compensating control. In these and similar situations, you can dispute the vulnerability through an official dispute process. Alert Logic provides the Alert Logic PCI Dispute system for handling disputes, which you can access directly from your PCI Scan Results report in the Alert Logic console. When disputing a vulnerability identified in results from an Alert Logic PCI Scan, use the Alert Logic PCI Dispute system; do not submit the dispute to the PCI SSC. The Alert Logic PCI Dispute system is sometimes referred to as "PCI Referee". For compensating controls, see the Payment Card Industry (PCI) Data Security Standard. Only companies that have undertaken a risk analysis and have legitimate technological or documented business constraints can consider the use of compensating controls to achieve compliance. To dispute a vulnerability, you provide an explanation and supporting evidence for the disputed findings, and submit the information for review by an Alert Logic ASV Security Engineer. After you submit your dispute request, the engineer, with whom you can communicate through the PCI Dispute system, reviews the submitted evidence and makes a ruling. The following procedure explains how to submit your dispute using the Alert Logic PCI Dispute system. Under Latest 25 Reports, click the link for the PCI scan results containing a vulnerability to dispute. Under PCI Scan Result, locate the Date and Report ID values. You must provide this information when you contact Alert Logic. The PCI Scan Disputes page appears, displaying the list of identified vulnerabilities. Click the box next to the vulnerability. In the Notes box, type your dispute statement. Review Dispute statement guidelines and examples for guidance when developing your dispute statement. (Optional) Click attach file to upload supporting documentation. The PCI Scan Disputes page provides features that can help when disputing multiple vulnerabilities or vulnerabilities that have been disputed before. For more information, see Work with the Alert Logic PCI Scan Disputes page. After you have addressed each vulnerability, the Contact Information box appears at the bottom of the page. Under Contact Information, enter your information, or the information for the person responsible for PCI accountability. Review your dispute content. Make sure each dispute statement is correct and complete. Once you submit a dispute, the statement cannot be modified; you can only add evidence that addresses the statement. Click Start Dispute to notify Technical Support of your dispute request. Both you and the designated dispute contact at your company receive confirmation of the dispute request by email. If you need assistance, call Technical Support (US: (877) 484-8383, EU: +44 (0) 203 011 5533). After you submit your dispute, an Alert Logic ASV Security Engineer reviews your request. After the engineer makes a ruling, you will receive an email notification. At that time, you can review the dispute and add further comments. Once you submit a dispute, the statement cannot be modified; you can only add evidence that addresses the statement. Under Latest 25 Reports, click the link for the PCI scan results for which the dispute was requested. On the PCI Scan Results page, under Report Downloads, locate the dispute request status banner, and click the provided link. The PCI Scan Disputes page appears, where you can review comments, provide updates, and communicate with an Alert Logic ASV Security Engineer. The PCI Dispute system is a process for disputing findings in PCI scan results. The Alert Logic PCI Scan Disputes page is the interface for submitting the dispute requests. This topic provides an overview of working with the PCI Scan Disputes page. A detailed description is provided for each vulnerability. To display the entire description, hover over the description. Any exposures that have been disputed in a previous scan are identified with an arrow ( ). For these items, you can prefill information from the previous disputes. Multiple exposures of the same vulnerability type can be located by clicking the vulnerability link. You can also locate all exposures on a particular asset, on a particular port, or related to a protocol by clicking the respective link. You can then address the similar vulnerabilities in bulk. Vulnerabilities that have had supporting documentation entered are ready to be submitted and have a check mark ( ) next to them. The number of vulnerabilities yet to be addressed is reflected in the upper right corner. All vulnerabilities must be addressed before you can submit your dispute request. You can sort the list of vulnerabilities by various parameters, and you can search all content using the search box. Risk Level (CVSS score). Note: The risk level is not visible on the PCI Scan Disputes page. To see the risk level, hover over the vulnerability to display the entire description, which contains the risk level. You can also generate the PCI Scan Vulnerability Details report. To search the content, type a value in the search box. For each vulnerability, you must specify a dispute type and supporting documentation. Use the following procedure to enter this information for one vulnerability at a time. After you have entered your supporting documentation, a check mark ( ) appears next to the vulnerability, indicating that it is ready to be disputed. To hide the entry fields, click on the box for the next vulnerability. The number of vulnerabilities to complete is adjusted. For vulnerabilities that share the same dispute types and supporting documentation, you can address multiple exposures in bulk. Click on a vulnerability link to select all vulnerabilities of that same type. You can also select all exposures on a particular asset, on a particular port, or related to a protocol by clicking the respective link. When you make your selection of multiple vulnerabilities, the Bulk Operations box appears, displaying the number of exposures selected. To hide the Bulk Operations box, click the arrow. Select a dispute type from the drop-down list. In the Comment box, type your dispute statement. Review Dispute statement guidelines and examples for guidance when developing your dispute statement. Click select file and locate the files to upload. In the Comment box, type any supporting comments. Click Apply to enter this information for each selected vulnerability. If you have already disputed some of your vulnerabilities, you can re-use the comments submitted in your previous dispute. An arrow ( ) appears next to each of the previously disputed vulnerabilities. You can prefill these vulnerabilities individually, or you can prefill all of them at the same time using the Prefill button. The Prefill button displays the number of previously disputed vulnerabilities. To prefill information for a single previously disputed vulnerability, click the arrow ( ) next to the vulnerability. To prefill information for all previously disputed vulnerabilities, click Prefill. The following example shows the results of having used the Prefill button. Comments are copied from your previous disputes for both vulnerabilities, the arrows ( ) change to ready indicators ( ), and the number of vulnerabilities to complete is adjusted. If you manually enter comments for a previously disputed vulnerability rather than using Prefill, the action is reflected with both the arrow and check mark ( ). After you have entered comments for all exposures, the Contact Information box appears at the bottom of the page. Enter required Name and Phone number, and any other additional information, and click Start Dispute to submit your dispute request. After your dispute has been submitted, an Alert Logic ASV Security Engineer reviews your request. If additional information is required, you can communicate within the PCI Dispute system. When you dispute a vulnerability finding, you provide the type of dispute and an explanation for your dispute. Also, if an issue appears with a PCI assessment, the only way to pass the check is to provide an acceptable dispute; PCI does not recognize a justification of the presence of the issue alone as a valid dispute. Provide detailed, specific information about the reasons you believe the scan result is a false positive. Provide proof that you have resolved the scan vulnerability. Provide specific information about the operating system, service, or patch level if the issue under dispute is version-specific. Do not address a configuration issue by simply claiming to be patched against the issue. Do not claim the software in use is the latest version and not include evidence that the version in use does not include the same risk. Do not claim a detected plug-in or product version is incorrect and not provide evidence of the difference. Make sure the dispute statement is correct and complete before you submit it. Once you file a dispute, the statement cannot be modified; you can only add evidence that addresses the statement. Incorrect: This does not affect our version of Windows. Correct: The discovered vulnerability (MS06-057) does not apply to the version of the operating system that we run (MS Windows 2008 R2). If the assessment reveals a version of .NET 2.0.xxxx, and you do not use this version of .NET, you must include evidence that .NET 2.0 is not in use. If the scan detects a version of a service considered vulnerable, and you use a different version of the service, you must include the version of the service in use. If you operate multiple versions of a given daemon on some systems, and a version of a web server is shown as a vulnerable version, you must provide a statement that the version reported by the server itself to the scanner is wrong. Also, you must provide documentation that the service bound to the port is the correct version. An acquirer is typically the entity, such as a credit card processor, that provides credit card processing services. Prepare final PCI scan reports. Prepare Self-Assessment Questionnaire and Attestation of Compliance. Submit final PCI scan reports, SAQ, and Attestation of Compliance to your acquirer. When your PCI scan results are compliant, you can generate your final reports for submission to an acquirer. Under Latest 25 Reports, click the name of the scan results to submit to your acquirer. The scan results must have a status of compliant. The Vulnerability Details report is available as a .csv file in addition to the PDF download. The .csv file includes less detail than the PDF, but the information is easy to view and analyze in a spreadsheet. If you want to send feedback to the PCI SSC regarding your scanning experience, your experience with Alert Logic, or any other aspects of PCI scans, click the PCI ASV Feedback Form link below the list of reports. To validate compliance with PCI DSS, you must submit a Self-Assessment Questionnaire and Attestation of Compliance with your final PCI scan reports. You can obtain the required documents from the PCI SSC, as described in the following procedure. Use the guidelines provided in the table on the PCI SSC website to determine the appropriate questionnaire for your company. Note the letter code for the questionnaire. Referencing the letter code, locate and download the appropriate questionnaire from the PCI SSC document library. You can choose DOC or PDF format. Host discovery determines if a computer or IP address is active. It is a balance between detecting legitimate hosts and flooding empty address ranges with unneeded traffic. The ASV scan solution must make a reasonable attempt to identify live systems, including live systems that do not respond to ICMP echo (“ping”) requests. A ping sweep using ICMP messages is sent to each address. If an answer is not received on the first attempt, another ICMP ping is made. ICMP timestamp requests are made. Alert Logic sends a TCP ping to commonly used ports. TCP pings use a deviation of the TCP standard three-way handshake to determine if a computer responds. This method sends an unsolicited TCP Acknowledge (TCP ACK) to the specified port. If an active computer is listening on this port, it should send back a reset to the unsolicited request. Another method involves sending a TCP Synchronize (TCP SYN) message (similar to the TCP ACK) to the commonly used ports and looking for a response. The most common UDP ports are tested for response. An active host sends a response to indicate a port is closed. In some isolated cases, these methods may not detect all hosts. Alert Logic recommends that you enable ICMP echo (ping) or ICMP timestamp as a beacon to the Alert Logic scanner. The port scanning segment of the scanning process is split into two parts: the TCP port scan and the UDP port scan. Alert Logic uses full connect scans on both types of ports. The scanner makes a connection to the target server through each port in the scan policy. Port open: These ports get examined further in the next step of the scanning process. Port closed: These ports are ignored for the remainder of the scan. No answer or dropped package: These ports are filtered out because the Alert Logic request can not get through. The time out period on these ports is ten seconds. The scanner attempts to make a connection to the target server through each port in the scan policy. The scanner waits the maximum amount of time for each port. The scanner labels each port as open or filtered. UDP ports do not always send responses even if they are open, so the scanner sometimes labels open ports as filtered. UDP ports take much longer to scan than TCP ports. If you want to scan more than the list of common ports, you must enter a custom port list. After the port scan finds open ports, the service detection segment of the scan identifies which services are running on the port. The scanner searches all open ports for all known services, in case services are running on non-standard ports. The scanner sends traffic to ports using various protocols and records those that get responses. TCP ports: The scanner sends specific queries to the port until it receives a recognizable response. UDP ports: Because UDP ports without connection errors are inferred to be open, UDP service detection is both slow and unreliable. Many systems filter out ICMP error messages, or only send a certain number of error messages per second. The scanner analyzes each response received and determines which type of service sent the response. The scanner runs the Nmap service and version detection. The scanner runs proprietary Alert Logic service and version detection. Results from the two steps are then combined together into a comprehensive list of software, versions, and patches. In the vulnerability evaluation phase, Alert Logic compares the software/version/patch list to its vulnerability database. The database includes over 70,000 vulnerable versions and their associated vulnerabilities. The scanner matches the software list with the vulnerability database and provides clients with a list of vulnerabilities that may be present in their environments. The scanning solution tests the router for known vulnerabilities and configuration issues in the firmware. Vendors release patches to address new exploits and flaws. The scanning solution verifies that the operating system has the latest patches installed. New exploits are found regularly for database products. The scanning solution detects exploits and open access to databases. The scanning solution tests for all known vulnerabilities, exploits, and configuration issues on web servers. New exploits are routinely discovered in web server products. The scanning solution detects and reports known exploits. The scanning solution checks for other best practices, for example, making sure that directory browsing is not possible on the server. Alert Logic supports complex passwords; however, some special characters give command line interfaces difficulty, as they have special meanings. Keep your password special characters limited to numbers (0-9), periods (. ), colons (:), semi-colons (;), quotes (',',","), percentages (%), and spaces ( ). Alert Logic scanning enables safe and accurate assessments without affecting network operations. If the system finds an open SNMP service, it will poll it for as much information as possible (true operating system, real hostname, patch level), but it will not attempt to exploit holes to demonstrate what an attacker can do. Backporting involves taking a software patch and applying it to an older version of the software than the version it was designed to modify. Backporting is specific to some UNIX/Linux and open source vendors. See also Red Hat about backporting security fixes. If you are using zero privileged level of network scanning, then Alert Logic scanning provides the option to ignore a vulnerability, which documents the presence of your vendor-supplied patch and suppresses further reporting of this issue on those IP addresses. 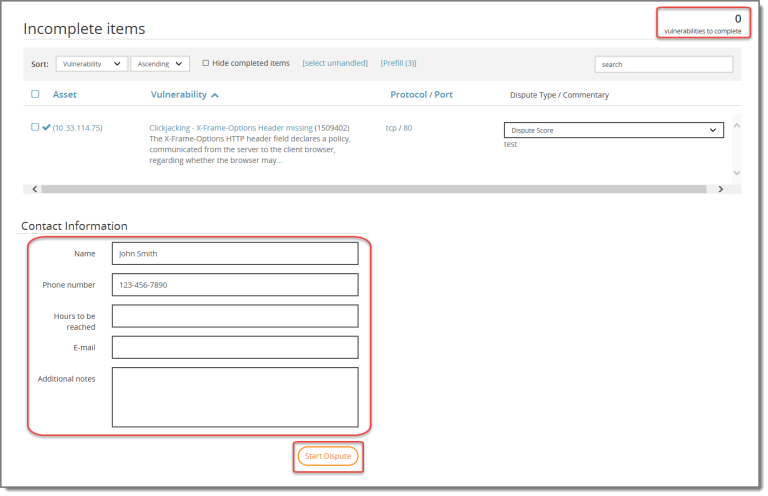 You can export the list of ignored vulnerabilities as a report to give to other auditors showing the documented fixes for supposed network vulnerabilities. Network scanners report based on the found version, and auditors expect all vulnerabilities to be enumerated and exceptions to be documented. The best way to handle backported patches is to do credentialed scans. The preferred method for handling this is using the OVAL algorithm and data feeds Alert Logic gets directly from RedHat and other Linux vendors. When you run scans with credentials, the system automatically enumerates the list of installed patches and auto-suppresses vulnerabilities that have been addressed by backported patches. Alert Logic scanning can do this internally and externally from the internet, but it requires standard user access to a Secure Shell (SSH) service on that computer. When a network vulnerability scanner assesses a computer, it bases some of its findings on found versions of software. If these versions are known to be vulnerable to certain issues, they are enumerated as vulnerable to their respective CVEs. If your vendor backports security fixes and does not update the software version number, you may not be vulnerable despite what the Alert Logic vulnerability report states. This vulnerability appears in a report when the name listed in the SSL certificate configuration does not match the name used to access the host. This is an automatic failure for external PCI assessment scans due to the inability to verify the legitimacy of the host. This vulnerability commonly appears when an administrator reuses an SSL certificate from one web application for another. For example, an SSL certificate created for www.mydomain.com can not be used for mypage.mydomain.com. Use the mitigation methods listed below to address this vulnerability. Purchase a new SSL certificate created specifically for your web application. Use a wildcard SSL certificate for any page on the domain. Update the reverse DNS record of the IP address to be the same as the subject of the SSL certificate. The scan will automatically detect the reverse DNS name and if it matches the subject of the SSL certificate, the issue will not be flagged. Update the SSL Certificate subject line to match the host name of the device. If the scanner was unable to resolve a host name for the host, it is typically related to the configured DNS servers not having a record of the host. If the certificate is not valid because it is a generic or default self-signed certificate, you can choose to filter the vulnerability at the IP or job level. If the host name (or lack thereof) provided by the certificate does not match the host name discovered during scanning, this is a valid finding. Filtering this vulnerability is at the discretion of the client only. If the scan result is a false positive, you can make the exposure inactive to remove the results from reports. In many cases, the SSL certificate host name discrepancy appears because the host was scanned via IP address instead of via fully qualified domain names (FQDN). PCI-DSS requires customers to supply FQDNs in addition to providing all external-facing IP addresses and all other unique entryways into applications for the entire in-scope infrastructure. This information must be included when you schedule a scan. Localized load balancers: You must supply documentation showing that the infrastructure behind the load balancer(s) is synchronized in terms of configuration. External load balancing services: Implement a configuration to ensure that all IP addresses and ranges provided are successfully scanned. If you believe that a PCI assessment failure was in error, first verify that the FQDN resolves to the host using an outside source such as www.sslshopper.com or www.digicert.com/help. These sources may also identify other certificate problems. If the FQDN resolves to the host, you may submit a dispute. Provide the FQDN in the dispute comment so that Alert Logic can validate the certificate. Enter only one FQDN per host. A single dispute comment containing a blanket statement for all hosts found in the scan is not acceptable. In the case of a load balancer, provide all expected IP resolutions of the FQDN and confirm that hosts behind the load balancer are in sync. In general, using the FQDN in the scan configuration prevents this vulnerability from appearing. Alert Logic scanning does not perform straight brute force attempts against logins, as there is too great a risk of causing a denial-of-service situation by locking out accounts. Alert Logic does not run any test that can cause significant or fatal damage to a system or application. Alert Logic can test some buffer overflow and denial-of-service (DoS) vulnerabilities without harming your server or service. Strict quality assurance measures ensure tests are safe before release. It is impossible to test for all configuration possibilities and it is difficult to completely rule out any disruptions. For vulnerabilities that require a non-active testing method, the Alert Logic scanning system deploys a passive scan operation utilizing versioning, configuration testing, and inference to determine the likelihood of the existence of a given vulnerability. Vulnerabilities that cannot be completely verified are stated as warnings, with associated detail to evaluate mitigation strategies for that issue. Alert Logic has identified two scenarios in which active testing could cause a DoS situation on a network. If an internal Threat Manager appliance is placed behind a firewall and instructed to scan computers on the other side of the firewall, the appliance could exhaust the available outbound connections/resources of the firewall. This has happened on Cisco PIX firewalls where port address translation (PAT) was used to PAT private, internal addresses to the outside interface. During the port scanning phase of the scan, a large number of connections are initiated to identify all open ports on a target device. Place the appliance on a segment of the network where it does not have to go through the firewall to reach the target. Provide a static IP translation for the IP address of the testing unit. This reduces the number of connections the firewall must "remember" during testing. An appliance performing a high level of logging can cause a DoS situation. This has happened in both internal and external testing. This scenario is a classic security vulnerability. If a firewall logs every connection attempt to a remote system, it could generate gigabytes of log file traffic, which causes a strain on network infrastructure and exhausts file system resources of the remote logging console. This is a known problem with debug-level logging (i.e., logging everything). When a port scan is performed, the number of connections to a device can range from 1,500/3,000 ports connection attempts up to 65,535/131,070 ports connection attempts. To prevent a DoS situation, use a lower level of logging. If your environment has a web farm behind a load-balancing device, there is no way to asses all devices, because the load-balancing device creates the algorithm that determines load distribution. The Alert Logic software would find issues in your code base, but computer-specific issues might be missed due to the decisions made by the load-balancing device. To ensure that Alert Logic scans each device, place a Threat Manager appliance where it reaches the individual computers in the web farm. Alert Logic scanning generally tests for any operating system that supports a TCP/IP stack; however, results vary among operating systems. DOS and Windows 3.1 WFWG support TCP/IP, but few known vulnerabilities exist for these systems. Alert Logic does not rely on operating system guessing as a part of vulnerability assessments. For instance, a network that uses an F5 BIG-IP load balancer on its perimeter would skew the results of a test that relied on operating system guessing. While the web site being hosted could reside on a Microsoft IIS server, the BIG-IP itself fingerprints as a BSD UNIX operating system. In this case, a more comprehensive test prevents inaccurate and possibly dangerous results. Operating system guessing and host name determination in Alert Logic scanning is based off of a weighted system. The report shows the item with the highest weight (confidence factor). Alert Logic allows you to use credentials to perform host-level authenticated scanning. Using Windows or SSH credentials as part of your scans allows for more accurate vulnerability scans and lowers the number of false positive results. Windows authenticated scanning is an authenticated network-based method for interrogating the target machine for missing security-related patches and updates. Credentials— Alert Logic scanning needs a local or domain administrator account to accurately assess the patch level of your computers. Network access to RPC, NetBIOS or SMB/CIFS ports— Alert Logic scanning requires access to RPC (135/tcp), NetBIOS (139/tcp, 137/udp, 138/udp) or SMB/CIFS (445/tcp and 445/udp). Network or personal firewalls blocking access to any of these protocols will prevent access to Windows patch scanning. Enable Remote Registry servicesThe Remote Registry service must be enabled and started. Verify this from the Administrative Control Panel under Services. If the authentication fails, the scan report will list Exposure ID: 16205 - Local Checks Error. Use the following procedure to set up a dedicated user that Alert Logic can use for authenticated scanning. Click Start, type lusrmgr.msc, and press Enter. Right-click the Users folder, and then click New User. In User Name, type a new user name (for example, Alert Logic Dedicated Scanning User). In Password, type a password. In Confirm Password, type the password again. After the window refreshes, indicating successful user creation, click Close. Click the Groups folder, then right-click Administrators and click Add to Group. On the Administrators Properties window, click Add. On the Select Users window, in Enter the object names to select, type the newly created user (for example, Alert Logic), and click Check Names. After the window refreshes, reflecting any changes and user confirmation, click OK.
On the Administrators Properties window, confirm that the user appears under Members, and click OK. The Alert Logic scanner needs to connect to Windows Management Instrumentation (WMI) on the machine, in addition to remote registry, to pull version information from .dll and .exe files, as well as information stored within Windows Management services and settings. Unlike Unix and Linux, which come with SSH secure remote access where the system can log on and interrogate things as a user, Alert Logic scanning requires the administrative privileges due to the limitations of methods available to remotely access Windows machines. Alert Logic scanning does not make registry changes and does not write to the machine. To learn more about registry keys, refer to the Microsoft documentation here. The Open Vulnerability and Assessment Language (OVAL®) method is the preferred method of network-based patch scanning. The scanner uses the OVAL method for assessing Windows-based machines for a variety of Microsoft-specific and third-party application security patches. WMI comes installed on all Microsoft operating systems. The following procedure describes how to enable remote access to WMI. On the target server, go to Administrative Tools, Computer Management. Right click on WMI Control, then select Properties. Add the scan user (if needed), and then be sure to check Remote Enable for the user/group that will be requesting WMI data. If the above steps didn’t help, Alert Logic recommends installing the WMI Administrative Tools from Microsoft. This includes a WMI browser that will let you connect to a remote machine and browse through the WMI information. That will help to isolate any issues in a more direct and simple environment. Once the WMI browser can access a remote machine, Alert Logic should have access as well. All UNIX and Linux authenticated scanning (security patch scanning) is performed with Secure Shell (SSH) access using a standard user account. If the authentication failed, the scan report will list Exposure ID: 12152 - SSH Patch Scanning - Failed Logon. For authenticated scans to work properly in your environment, you must have your AWS security groups set to allow full access by the scanning appliance. Doing so allows a Cloud Insight appliance to communicate with client instances, so the authenticated scan can detect all possible vulnerabilities and configuration issues. Alert Logic installs appliances alongside the instances inside each Amazon VPC. By default, security groups are set up to allow full communication among group members. If you modify the default settings, authenticated scans may not reflect a full picture of your instance. Front end web traffic TLS 1.2 and AES 256 bit encryption, via HTTPS User credentials are encrypted using the public key from the FusionVM server, and only the FusionVM server can decrypt the information. FusionVM back end RSA and Api call EncryptByAsymKey, 2048 bit key length Encryption of user passwords and authentication credentials for scanned systems is handled by MS-SQL server. Encryption by OpenSSH in SSH connections between the Appliance and the FusionVM server. Scanning appliances do not have anything encrypted on the appliances except the password file for appliance login authentication. Alert Logic scanning looks for sample/default web pages left from an installation and commonly named files and folders that draw attention from malicious users. Some additional tools check web applications for rudimentary validation errors. Note that Alert Logic does not perform complete web application tests or source code audits, though many of the http checks overlap with custom application testing. Comprehensive web application scanning is a standard part of Alert Logic PCI scans. Web application scanning enhancements offer hierarchically deep, page-level scanning of common attack vectors including SQL injection and cross-site scripting. The scanning system indexes web servers and builds a list of hierarchical URL links in the website. Web application checks are performed separately for each URL to provide sitewide coverage. Wireless environments are transparent to the Alert Logic scanning system. Wireless devices have IP addresses and run applications just like other network systems. In that sense, wireless devices are assessed for security by Alert Logic. However, Alert Logic scanning is based on the Network layer (specifically IP only) and above; lower levels such as Data Link (PPP, SLIP, Ethernet, 802.11b, ATM, Frame-relay) and physical (Fiber, Cat-5, Cat-3, phone line, serial cable) are not within the scope of a network-based assessment. Alert Logic uses a variety of vulnerability suppliers: public, commercial, third-party, and vendor-driven. Alert Logic severity ratings come from the method used by the National Institute of Standards and Technology National Vulnerability Database, and are based on the CVSS Base Score. The Common Vulnerabilities and Exposures (CVE®) enumeration system was developed by the MITRE Corporation. The CVE website provides more information. Use the CVE number to find vulnerability text that other vendors/researchers have made available or correlate vulnerability assessments with IDS data. Vendor flaws is the largest category. It includes buffer overflows, string format issues, directory transversals, and cross-site scripting. This category includes any vulnerability that requires a patch or an upgrade to fix.